The title of this post is not what it appears to be.. I am being peer pressured by my Mum to go sky diving when we are in Hawaii. I am a teeny tiny bit scared of heights or my parachute not opening you know all that good stuff. She has been flat out putting the pressure on myself and my friend to do it with her. So my buddy finds someone that will jump with her.. yep awesome… nooooo she looked at the website and for 4 or more people they will give a group discount. The peer pressure stopped for approximately 2 hours which was good but now she is back at it. Well here is a video for you to make up your own mind. 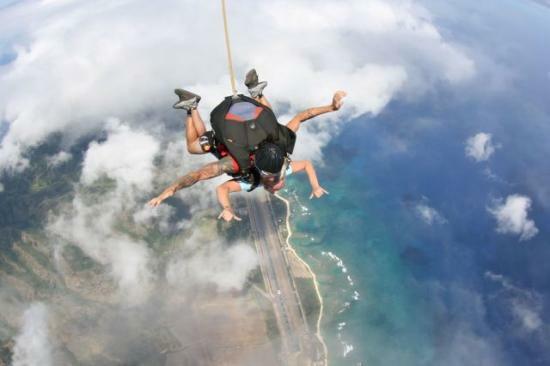 This entry was posted in Life and tagged Hawaii, Holiday, Sky Dive. Bookmark the permalink.